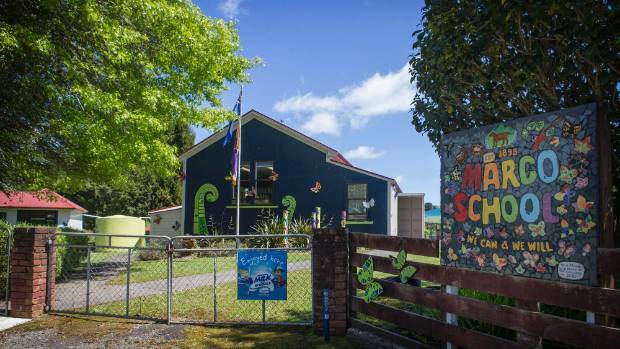 A tiny rural school on the Taranaki border is ‘back to normal’, its board chair says, six months after three staff, including the principal, were placed on leave following an altercation. In February, a dispute between two members of staff at Marco School led to the suspension of principal Jennifer Vincent. Two other staff members were placed on leave. Vincent was later reinstated, but after parents withdrew their children for two days she left the school, which has fewer than ten students. Fiona Parkinson is now stand-in principal. “All the kids are at school now and everyone seems to be happy with the arrangement,” board of trustees chair Walter Pease said. “We’ve got a stand-in principal in place; she’s there at least until the end of the year. In early February Vincent was suspended on full pay and two other staff members were placed on leave while the board investigated complaints, historic and current, made against her, according to a decision from the Employment Relations Authority. Teachers and parents had raised concerns about her performance and competence, and there were also allegations of misconduct, some of which were of a “potentially serious nature”, the decision said. The board also had concerns about her actions following a complaint against her brother, Rick Matthews, the school’s caretaker. The board claimed Vincent defied an instruction from it that Matthews would not be on school grounds during the day, while the investigation was taking place. Vincent was reinstated by the ERA. “The students weren’t at school for a period of time and that was the parents’ decision not to do that; that wasn’t anything to do with the board,” Pease said. He confirmed an apology was put out to the community in the school’s newsletter. He said he didn’t feel the kids had been too affected by the incident, and the school was back to normal. He said there was not much more he could reveal as he was bound by the settlement agreement.